From left to right: Kyu-Moon Yu, Michael Kosla, Garry Wicka, Kimun Paik, Clark Brown, Soon Kwon, William Cho, Dr. Jong Kim, Kevin McNamara, and DJ Kang. Indeed, after touring the new facility yesterday and after extensive briefings from key LG execs including Garry Wicka, LG Electronics USA head of marketing, Commercial Displays; Dan Smith, senior director of business solutions for LG Electronics; and Clark Brown, USA VP of Digital Signage, the facility lives up to the billing. The Business Innovation Center features an extensive, hands-on display of LG’s offerings from commercial AV and digital signage displays, hospitality market, and healthcare solutions, and more, with real, complex content, technical support, and product training, the goal of which will be to allow business owners, integrators, and contractors a chance to engage and learn about how LG’s leading line of commercial solutions—a process that will “contribute to an increased bottom line," according to the company. Dan Smith demonstrating the Ultra Stretch Signage 86BH5C.LG launched the Ultra Stretch Signage 86BH5C this week at the Innovation Center opening, a new 86-inch ultra-wide digital signage screen with a “stretched” 58:9 aspect ratio. According to LG’s Dan Smith, this new unit solves the problem of retail or airport settings, for example, where digital screens are “off to the side, outside of the line of sight of consumers who are just walking past the screens without looking at them.” It does this by placing the screens as “columns,” right in the viewer’s space. The new Innovation center is divided up into “industry zones": Retail & QSR Zones; Hospitality & VIP Zones; Smart Healthcare Zone; Outdoor Signage Zone; and the Energy Solutions Zone.Prominent at the grand opening yesterday were large- and small-format LG commercial displays for the retail space, including solutions that include LG’s webOS for Signage smart platform. Also on display were demos of In Plane Switching (IPS) technology that produces accurate and consistent colors from any viewing angle—as well as connectivity that can easily be customized across each business. One of the highlights of the unveiling, the Ultra Stretch Signage 86BH5C can display dynamic content depending on the user’s installation environment and can double as digital décor. With 4K Ultra HD resolution and a Picture-by-Picture (PBP) feature—which allows the user to divide the long, rectangular screen into four parts in landscape or portrait installations—the integrator can customize the screen to maximize content. The Retail Zone’s flagship products also include LG’s largest 4K UHD digital signage display, the 98-inch class (98.0 inches measured diagonally) 98LS95A, and LG’s all-new Direct LED Video Wall VH7B featuring an ultra-slim bezel, at 0.9 mm, that is ideal for retail stores that require a giant-screen commercial installation. LG’s 98LS95, a huge 98 inch, Ultra HD display with webOS. 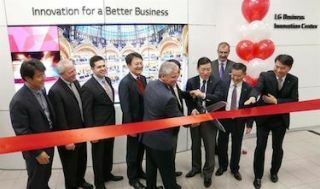 In addition to the new Chicago LG Business Innovation Center, LG Electronics USA also just opened the Atlanta LG Business Innovation Center within its newly expanded U.S. Air Conditioning Systems Headquarters in Alpharetta, GA. Those LG centers are the first of their kind in the United States and two of only nine such centers around the world. Other LG Business Innovation Centers are located in Amsterdam, London, Sao Paulo, Moscow, Ho Chi Minh City and Hanoi, Vietnam, and Dubai, United Arab Emirates.